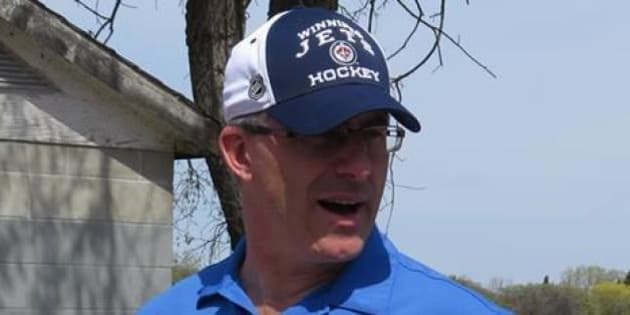 WINNIPEG - A candidate for the Winnipeg mayoralty said Tuesday he is staying in the race despite an ongoing controversy over his wife's comments about aboriginal panhandlers. A handful of protesters heckled Gord Steeves at his first appearance since his wife's comments were brought to light last Friday. "My wife was ... scared and angry, and she did something in poor judgment and she acknowledges that and she apologizes," the longtime city councillor said. "She is a good, caring wonderful person, a great mother and a wonderful wife — the most important person to me in this world." Steeves has been considered one of the front-runners in the eight-person contest to replace Sam Katz, who is not seeking re-election Oct. 22. Last Friday an anonymous Twitter account posted a Facebook message from Lorrie Steeves from early 2010. Steeves wrote that she was "really tired of getting harassed by the drunken native guys in the skywalks. We need to get these people educated so they can go make their own damn money instead of hanging out and harassing the honest people." The post also said: "We all donate enough money to the government to keep their sorry asses on welfare, so shut the (expletive) up and don't ask for another handout." Lorrie Steeves apologized in a brief written statement late Friday and said she felt terrible about the remarks. Her husband remained silent until Tuesday and refused interview requests. "It was a difficult weekend. I'm a candidate in a mayoralty election, but I'm also a husband and a father. I had to take care of my wife and my family to a large extent this weekend," he said Tuesday. Steeves said his wife's 2010 Facebook post was written after she was threatened at least twice by panhandlers. In one case, he said, she and their two kids were approached by a large, inebriated man who raised his hands and made threatening noises. In another, Steeves said, his wife was alone and approached by three panhandlers for money. "One of the panhandlers jumped up and put his finger in her face." Steeves has drawn a lot of criticism on social media and websites. Some aboriginal leaders have said the comments are racist and reflect a not-uncommon suburbanite view of downtown aboriginals. But some members of the public have supported Steeves, saying his wife expressed a legitimate fear of panhandlers, regardless of race. The Facebook comments were leaked the same day Steeves announced a plan to crack down on public intoxication downtown, largely by putting more officers on the streets in key areas. Althea Guiboche, who tried to interrupt Steeves's news conference, said afterward she was not convinced that Steeves and his wife truly regret the 2010 remarks. "He should drop out of the campaign, first of all, because we do not need any more leaders that are going to take us down the wrong road," she said. "It's just going to be detrimental to have a leader that looks upon people like they're nothing and is not shy about it."